In Europe the early summer of 2013 was meteorologically extreme for many reasons. First there were floods in southern and eastern Germany in June, then large parts of Central Europe experienced a heat wave with temperatures peaking far beyond 35 °C in late July – the highest temperature in Germany was recorded in Rheinfelden (Baden) at 38.6 °C. 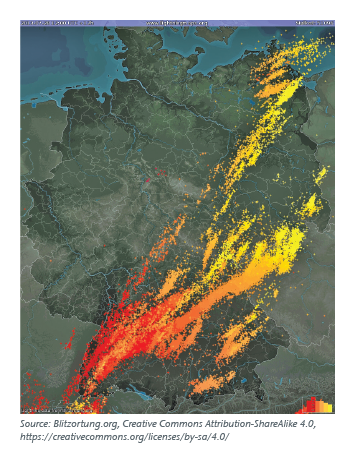 The extremes eventually culminated in a weather front that crossed large parts of Central Europe between 26 and 30 July 2013, raining down hailstones leaving swaths of destruction. In Germany, in particular, a region 5 km by 27 km south of Stuttgart on the borders of the Swabian Alb, as well as a zone northeast of the Ruhr up to Wolfsburg, were severely affected. At EUR 2.8 billion, the hailstone damage caused by the depression Andreas on 27 and 28 July 2013 was the most expensive hailstorm in Germany’s history and the world’s most expensive event for the insurance industry in 2013. In Germany hailstones during the summer months are actually nothing out of the ordinary and every year they cause damage to buildings, vehicles and agriculture. The available hail maps and radar-based analyses show that hailstorms commonly affect regions in the foothills of the Alps and around low mountain ranges.1 According to analyses carried out by the Karlsruhe Institute of Technology (KIT), hailstones fall on average 30 days each year in Baden-Wuerttemberg alone. However, extreme hailstorms on the scale of the storm in July 2013 are very rare. In spite of the relatively small area affected, the extent of damage reached epic proportions, the kind that we would normally only expect from severe natural disasters. Until then, the most expensive hail damage in Germany — the equivalent of EUR 750 million (DEM 1.5 billion) in insured damage — was caused by a storm in the Munich region on 12 July 1984. Converted to today’s values, this equals damage totalling approximately EUR 1.5 billion; Andreas, on the other hand, caused almost twice as much damage to the insurance industry. July 2013 was characterised by mostly dry, very warm and yet not extremely hot summer weather. However, in late July a short, intense heat wave developed over Central Europe. On 27 July, temperatures in Germany peaked and according to the measurement network of the National Meteorological Service of Germany (DWD), at 38.6 °C Rheinfelden (Baden) was officially the hottest place in Germany and the second hottest in Europe. One day later, on 28 July, the focal point of the heat wave shifted further east towards northern Italy and Austria, until the annual record of 41.6 °C was registered in Banja Luka (Bosnia and Herzegovina) on 29 July. In contrast, the situation in Western Europe was completely different; there were frequent storms in the transition zone between warm sub-tropical air and cool Atlantic air as early as 25 July. During the nights of 26 and 27 July, France experienced a massive storm system where a mesoscale convective complex (MCC) developed in the coastal regions of Southern France before reaching Belgium and the far west of Germany in the morning of 27 July. Gradually petering out, it moved further northeast whilst a persistent supercell formed over North Rhine Westphalia on the southern edge of the system and moved over Lower Saxony, Saxony-Anhalt and eventually Berlin. Hailstones of up to 8 cm in diameter fell over this region and hailstones measuring up to 12 cm were recorded in Sehnde (Lower Saxony). Thus, the supercell produced extraordinarily large hailstones for Central Europe, with a wide enough diameter to be among the largest to fall in Germany. This led to hundreds of millions of euros’ worth of claims resulting from damaged cars and destroyed roofs. This front continued eastwards on 28 July. In the afternoon of 28 July, the cold front of Andreas was over north-eastern France and western Germany. Up to this point, southern Germany was still recording temperatures of over 30 °C. The heat wave then ended abruptly and, for many areas, dramatically, when a supercell formed over the foothills of the Black Forest before moving east-northeast along the northern border of the Swabian Alb and the Franconian Jura, gaining strength and producing very large hailstones as it went.2 The region around Reutlingen and Tübingen, south of Stuttgart, was the most severely affected. There, hailstones measuring up to 10 cm caused serious damage to buildings, vehicles and agriculture, which will be described in more detail below. A supercell is a giant, persistent and highly concentrated type of storm cloud. Unlike the multicell MCS and MCC systems mentioned above, a supercell does not constantly produce new single storm cells; the entire complex continuously regenerates. This is made possible by the constant inflow of moist, warm air into the updraft of the cell. Vertical wind speeds in the updraft can exceed 180 km/h. The horizontal spread of the supercell can cover up to 50 km and in terms of its height, the cell can reach the lower edge of the tropopause. Its rotation allows it to persist for several hours and it is associated with extreme events such as squalls, heavy precipitation and massive hailstones. The type and severity of damage caused by hail depend on a range of factors: the number of hailstones per square metre, the size and density of the hailstones, the local wind speeds and the impact speed of the hailstones.3 The size of the hailstones is the most significant factor. The larger, heavier, harder and more uneven the hailstone, the more damage it can cause. The hailstone damage scale of the Swiss Association of Cantonal Fire Insurance Institutions (VKF) contains 11 categories of intensity, ranging from small hailstones measuring less than 0.5 cm to extraordinarily large hailstones exceeding 10 cm in diameter. Depending on the diameter, the weight can vary from 0.1 g to over 500 g. Damage to cars, windows and roofing materials is caused by hailstones with an approximate diameter of at least 2 cm. Hailstones of this size can reach falling speeds of around 70 km/h. However, extraordinarily large hailstones with a diameter of 10 cm, like those observed in Reutlingen in July 2013, can reach falling speeds of over 150 km/h and therefore generate an impact force over 500 times higher than that of a 2 cm hailstone. The occurrence of hail in combination with strong squalls that boost the speed of the hailstones and can significantly increase the damage potential, is another reason the damage varies so greatly. As a result, damage to vertical surfaces (cladding, windows, etc.) greatly increases in the presence of high horizontal wind speeds, as was the case during the hailstorms in July 2013. The combination of the large hailstones described above and strong horizontal winds in the Andreas storm front resulted in an enormous loss burden. The insured damage is currently estimated to be between EUR 2.5 billion and EUR 3 billion. 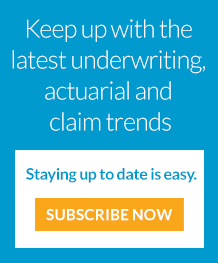 As a result, this event is not only larger than the Munich hailstorm of 1984, indexed to current values, but it is also the world’s largest insured event in the year 2013. At this point it should also be mentioned that the German insurance industry was also massively affected by the second largest insured event of last year — the flooding of the Elbe and Danube. Overall, this led to major losses in residential building and motor own damage insurance. For residential buildings, the combined ratio for 2013 was around 135%. As a result, this line of business generated negative underwriting results throughout the market for the twelfth year running. For motor own damage insurance, the combined ratio was roughly 115%. Combined with other, smaller hailstorms and two considerable storms at the end of the year, the German insurance industry paid out a total of more than EUR 7 billion just to cover damage caused by natural events.4 This is considerable, both financially and in terms of the extremely high number of claims settled in cooperation with the policyholders affected. One peculiar thing about hailstorms is the average amount of damage. Whereas for a storm event the average damage caused to residential buildings proves to be significantly lower than EUR 1,000, larger hailstorms can cause losses in the upper four-digit range; and there have even been hailstorms where the average damage caused was in the low tens of thousands of euros. From the effects of Andreas, we are expecting a claims expenditure of around EUR 8,000 per residential building in Baden-Wuerttemberg. This average level of expenditure per building will be driven by a number of smaller claims, but also by a considerable number of major claims with six-digit sums of expenditure. In commercial and industrial property insurance, significantly larger claims are of course possible. On 27 July 2013, for example, an industrial complex was so severely damaged by hail that we are currently expecting a claims expenditure of approximately EUR 45 million to cover the damage. What factors are responsible for this damage and how do these values change? In general, modern residential buildings — especially those built in accordance with the current energy saving regulations — are considerably more exposed to hail than traditional buildings, i.e., with massive exterior walls in the form of plaster or clinker brick facades. Facades consisting of thermal insulation composite systems have proven to be particularly vulnerable to hailstones. The horizontal direction of the hailstones was a significant factor in the damage of many of these facades, damage so severe that the reinforcement fabrics of the facades were affected and the structures had to be rebuilt – leading to the consequently high claims expenditure. The highly fragile rolling shutters, annexes and shading elements on modern buildings also contributed to above-average costs. Another element of modern buildings that can greatly influence the potential level of hail and storm damage is photovoltaic and/or solar thermal systems. 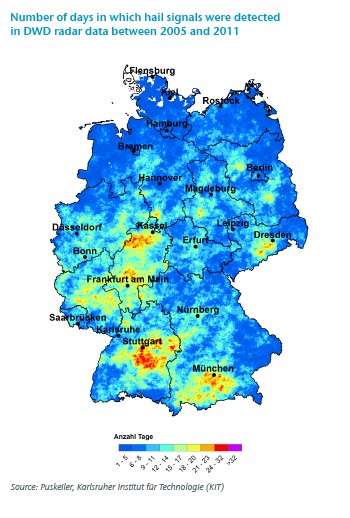 As Baden-Wuerttemberg is the German state with the second highest installed level of photovoltaic output (after Bavaria), the potential damage in this region is particularly high. Photovoltaic systems have actually proven immune to damage up to a certain size of hailstone and they can even protect the roofing underneath; however, we can expect an above average level of damage as soon as the hailstones become large enough to damage the panels. Unfortunately, we cannot provide a general predication in this regard because the susceptibility of each photovoltaic system to damage is influenced by a range of different factors. Besides the quality of the panels and their hailstone-resistance classifications, the age of the system and its pitch/alignment certainly also play a major role. This is the only way to explain the fact that even in the case of semi-detached houses, each with its own photovoltaic system, some systems survived the hail of Andreas with no visible damage while systems on neighbouring houses suffered massive damage. This certainly requires more investigation as to the exact causes. Not enough research has been carried out on how climate change affects the frequency and intensity of hailstorms for us to make any reliable or unequivocal statements on future developments.6 However, we do know that the insured sums are constantly increasing and that the vulnerability of modern construction materials to extreme weather conditions must be analysed over the long term. This analysis will allow the insurance industry to calculate the insurance contributions needed to match the risk in hailstorm-prone regions, based on the types of building materials. Probabilistic natural hazard models provide considerable support in estimating the claims expenditure of future extreme hailstorms. Such models could certainly also display variations of current damage. In a “what if” scenario, for example, Andreas would have caused considerably more damage if it had moved over the significantly more densely populated region of Stuttgart. Gen Re will develop a model like this for hailstorms this year and will therefore be able to model property damage as well as vehicle damage.